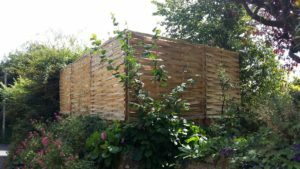 We have been making chestnut paling fencing since 1946 . We can make all sorts of styles, heights and spacing eg 3ft high with 3 inch spaces and 6ft high close ( which means barely no gap at all , only the natural gap from the cleft chestnut pales). Our paling can be bound in wire or can be attached to a wooden frame- whatever suits your needs. We can supply posts too of course. We also make beautiful handwoven cleft chestnut panels, cleft chestnut sheep hurdles and laths.